PROFESSOR LUPERDUG WALKED into his laboratory. It was a nice day in Neopia, however he was not happy. All of his efforts had failed. 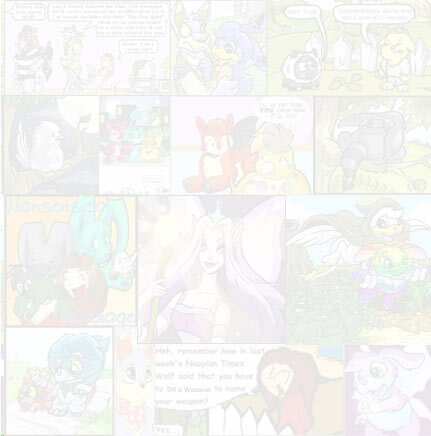 His project: build a video game that would attract Neopets users from all over. He just couldn't think of a good idea. �����The days wore on. 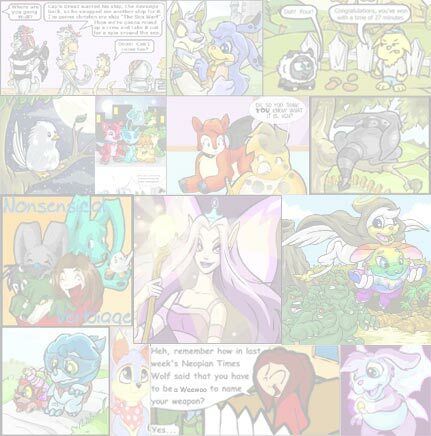 He decided to base a game off of Neopets history, a type which had not been thought up yet. He searched through the history books and came up with a great era of time to do. A time before Neopets had owners, a time when Doctor Sloth was living underground, toiling and being angry that Neopets existed, and a time when a young Lupe faced all odds, and fought the tyrant Eyrie wizard, Jahbal. �����He had everything perfected, until he realised one little problem: he had no one to test the game, no one to enjoy it. So he set out to find the perfect Lupe for the job. He ended up choosing a white Lupe, who's name he didn't care to ask. The Lupe loved games, and was an expert at them. He didn't care that the game's graphics weren't up to date. He didn't care that it had bugs. After all, it was the Beta test mode. �����Professor Luperdug walked over to a door, and said, "I'll be right back, I just need to insert this sample into a machine, for a test." He held up a small silver rock, and the young Lupe nodded, only half-hearing the professor's words. �����The professor opened the door and walked in. He proceeded to a machine, where he pressed several buttons. A tray opened up. The professor grabbed a suit out of it, and put it on. The rock was very dangerous when exposed to a certain material: phosphorus, which he would be exposing it to. �����He pressed a few more buttons. The tray closed and another part of the machine opened up. The professor set the rock in a small cylinder tube. He closed it, and pulled a switch. A screen popped up on the machine. It showed the rock, which was spinning around in the cylinder. He typed a few buttons on a keyboard. A laser shot the rock, and left no mark at all. The professor tried a few more tests, but nothing even damaged the rock. �����Meanwhile, the young Lupe continued playing the game. He had was at the part where he had to do certain things to decide his abilities and whatnot. There was a bug in the game, which caused it to crash over and over at the last part. He knew the professor would fix the problem, but he was getting sick of it. �����Back in the test room, the professor decided it was time for a dangerous test: exposing the rock to phosphorus. It had no effect. The doctor was very angry, but also tired. He extracted the rock and put it in a small container. He walked out of the room. He saw the young Lupe, very frustrated at a bug in the game. He had to continue getting his stats. The professor told him he'd fix it right away, and for him to come back the next day. The young Lupe agreed, and turned away. �����As soon as he turned, his tail hit the tray in Professor Luperdug's hand. It flipped it over and sent the rock cascading through the air. It broke through the screen on the game tester computer, and immediately reacted with the phosphorus inside. Brilliant arrays of light shot out, and they both screamed. �����The professor realised his suit was protecting him, so he grabbed the rock and he ran towards another room. His helmet fell off in the process, and he and the young Lupe were hit by the arrays of light. They eventually awoke in a strange wilderness. The professor gasped. He recognised it, as the world created in his game. �����Five days later, Mr. Henry, the boss of Professor Luperdug, walked into the lab. It was in ruins. Machinery all over the place, and a blown up computer screen with a chip lying nearby. He picked them both up, and took them over to another room with a computer. �����He hooked up the chip to the computer, then accessed it through the files. A game came up. It was called NeoQuest What he saw next shocked him. There was Professor Luperdug, lying in a cave. Next to him was a note. The game suddenly zoomed in on it. �����"To anyone who finds me dead, I assure you that I died happily. My experiments paid off. If you expose the rock that is lying next to me to the same amount of phosphorous contained in a computer monitor, even the smallest size, it will transport you back in time by 1,000 years. I made a mistake and only used a small amount on it inside the testing machine. Keep in mind that you will be transported without a way back, because their are no computers back now." �����"Due to this fact, please hold on to one when you transport back in time. Otherwise you'll be stuck, like myself. By the way, the young Lupe who went with me is going to find help, but I fear he will not be able to find me, as I have accidentally fallen into a crack, which I may not get out of." �����Mr. Henry couldn't believe it. So he decided there was only one thing to do: find out where exactly the professor died at, and then transport back in time and recover the lost Lupe. He knew it would take a long time, so he hoped the Lupe would survive until then. �����A few days passed, yet again. Mr. Henry had fixed the game so that it would be how it is at the present time. He knew that the game was only based on the real story, but also that the young Lupe was trapped in the real era that occurred 1,000 years ago. He decided to call up his best employee, a man by the name of Ben, who later be known as the Chiologist. �����Ben did a whole bunch of plotting and such things with astronomical views, to figure out where exactly the professor was when he arrived in 1,000 years ago, because the Earth was not in the same universal position. He eventually figured it out, after one month of plotting. �����Mr. Henry looked over an excavation site. They were digging straight down in a circle with the radius of twenty feet. They eventually got to a test suit, which was degraded and torn to shreds. They continued looking for the rock, when they found it wedged between two big stones. They pulled it out, and it glistened in the sunlight. There was only one problem now: waiting for a time when 1,000 years before it would put them on Earth. �����After days of plotting, they realised that they waited too long. So they gave up. Until, that is, Ben got a plan. He built a ray gun in his own lab, which took another three weeks. He built the rock inside it. When the trigger was pressed, the ray gun would expose the rock to phosphorus, and direct it as a beam, thus taking the one who was fired at back in time. The gun could also have Universal co-ordinates set into it. �����Unfortunately, it was too dangerous to try, so the plan was dropped. 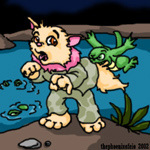 To this day, it is questionable whether or not the famous NeoQuest Lupe will ever be returned. In fact, this whole story may just be a myth, made up by a teenager with a wild imagination. We'll never know. Author's note: this story is fictitious, it was made up by myself because I had nothing better to do. If you're wondering where I got the idea for such a crazy story, play NeoQuest and click on the NQ button. It will open up a box which will contain words saying that it is the story of a Lupe who was thrown 1,000 years back in time. She found her mouth forming words. "Lily, Rosy, Emala - wherever you are, take this shield of power..."
Stevo leaned down to grab the hissing Cobrall by its long tail, while Keri and Les winced. This part usually didn't go very well.